PEREIRA FITZGERLAD dress; BOND BORN swimsuit; hat by Poppy Kural for Cartier; CARTIER necklace and bracelet. The glimmer of gold ribbon laced with wire. Under and over, under and over. Considered yet spontaneous, sublime in its inconsistencies. 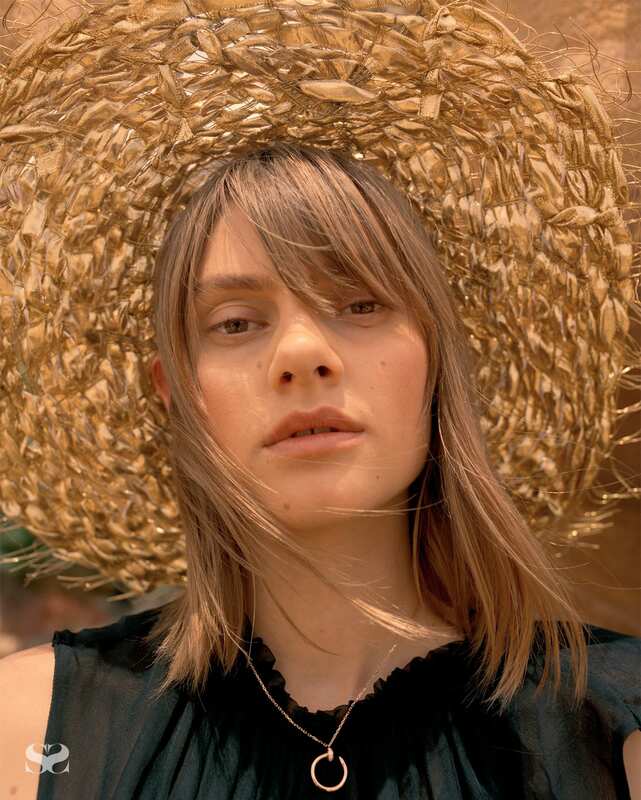 An embodiment of Cartier’s design philosophy – making the ordinary extraordinary – Sydney-based weaver and muse Poppy Kural turned an Australian staple, the beach hat, into a piece to be treasured. What once was an inanimate object is now a living, breathing work of art, shimmering under the Australian sun. In celebration of the collaboration and as a tribute to Cartier’s Juste un Clou collection, we chased the light to the brink of the ocean, and against the natural beauty of Sydney’s shoreline captured the custom piece in all of its unpredictable perfection. THOMAS PUTTICK shirt; BONDI BORN swimsuit; hat by Poppy Kural for Cartier. BONDI BORN bikini top; ANNA QUAN pants; hat by Poppy Kural for Cartier; CARTIER bracelet. BONDI BORN bikini briefs; hat by Poppy Kural for Cartier; CARTIER necklace, bracelet and ring. BIANCA SPENDER jacket and skirt; CARTIER ring. MATTEAU SWIM dress; CARTIER necklace. THOMAS PUTTICK dress; MATTEAU SWIM bikini top and briefs.